Retaining walls perform an important function in outdoor spaces, creating level outdoor areas that are more usable. Evergreen Companies, Inc offers retaining wall design to give you a functional wall that complements your home’s exterior. Our Raleigh hardscape professionals install retaining walls that are built to last, and engineered to hold up under the stresses they’ll encounter over time. We know that doing our best work is a matter of safety for our customers — and safety and durability are our first priorities when installing retaining walls. As water collects behind retaining walls, it can build up pressure and cause shifting or wall failure over time. All of our walls are installed with french drains installed behind them to properly drain water away and alleviate this pressure. 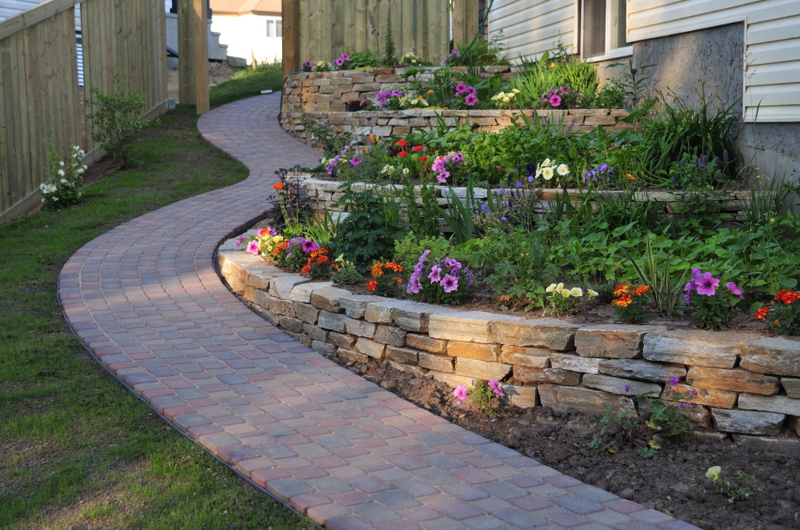 We consider every aspect of design, material selection and construction to build a retaining wall that will never fail. You can feel confident that your retaining wall is always safely performing its job. Contact us for a free retaining wall price estimate! We offer retaining wall construction services to clients in the NC Triangle, including cities like Raleigh, Cary, Apex, Morrisville, Holly Springs, Fuquay-Varina, Garner, Knightdale, Pittsboro, Wake Forest, NC and beyond.